Former Work and Pensions and Wales Secretary, Peter Hain has resigned his cabinet positions after the nature of his deputy leadership campaign donations were referred to the Metropolitan Police. "It is only right and proper that I step down from my cabinet positions to focus on clearing my name," said Mr Hain. "To do that I first need to clear the huge piles of cash out of my office. Everywhere I look there seems to be more of the stuff, huge crates of cash." Mr Hain said that any claims he has anything to hide are "absurd" amid the controversy over the late declaration of £103,000 of donations. "How can I hide anything? We are talking about thousands of notes!" 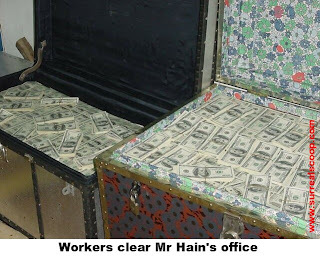 said Mr Hain speaking animatedly among a hail of bank notes that fluttered out of his suit. The Westminster political village was alive with rumour and innuendo regarding the shadowy Progressive Policies Forum - one of the key contributors which appears to have only been set-up within weeks of Mr Hain announcing his bid for the Labour Deputy leadership. Sources indicate it may be based in Nigeria and that Mr Hain was just an innocent victim. "There you are under pressure to raise funds for your bid to become deputy leader of the Labour Party and you get an e-mail from a doctor in Nigeria with an offer that could solve everything. It’s only natural that you forget to tell people about the details of enough money to buy a Maserati," said political blogger Guido Billingsworth. "It could happen to anyone." Mr Hain would not comment as to the detailed nature of the Progressive Policies Forum saying only that he did not understand why such a body that has produced no policies and has no employees would appear dubious. "It hasn't produced any policies because it has not had time, what with arranging the fleet of wheelbarrows necessary to get all those bank notes to me," he said. "Look, can someone carry out a few handfuls of tenners with them? They are really cluttering up the place now." That just looks like what me and the botches spend on lunch.